Regular exercise is essential to healthy living. However, past injuries and general discomfort can make it more difficult to make physical activity an everyday priority. Thankfully, there are products out there that make it easier to exercise, and they can provide support and help to speed up the recovery process. Kinesiology tape and compression wear are two common methods used by physiotherapists for those who want to begin exercising after recovering from sports injuries or inflammatory conditions. Let's take a closer look at the differences between kinesiology and compression, plus a new option that combines the benefits of kinesiology tape and compression products. According to the Ontario Kinesiology Association, kinesiology is defined as the science of human movement that uses evidence-based research to develop a solution that revolves around the idea of improved health, wellness and function for all. Kinesiology is used to prevent and reduce risk factors associated with serious medical conditions and also builds strong bones and joints. Specifically, kinesiology tape is designed to move with the body while providing muscle support and swelling reduction, as well as accelerating healing from injury and inflammatory conditions. Compression, on the other hand, places mass pressure on the area of distress. Compression clothing comes in the form of sleeves, socks, shorts and full body guards. These pieces are designed to increase blood flow and improve performance to shorten recovery time for athletes and those who exercise regularly. While kinesiology tape has been used by physical therapists for years as a method for speeding up recovery, there are multiple drawbacks to this tool. First, there are specific techniques for taping, which gives this product a learning curve that the average user may not be accustomed to. There's also the general discomfort of having tape adhered to the skin – not to mention the pain and annoyance that comes with removing it, as well as the sticky residue that's left behind after the fact. 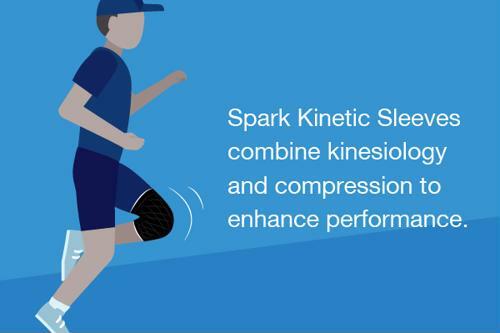 Instead of relying on such tape, why not try a more intuitive option that combines the science of kinesiology with the ease of compression wear? Spark Kinetic Sleeves, the newest product offered by Brownmed, use patent-pending technology to combine kinesiology tape and compression to enhance performance and provide comfortable support. The Spark Kinetic Knee Sleeve (available now) and Spark Kinetic Ankle Sleeve, Kinetic Elbow Sleeve and Kinetic Shin Sleeves (launching in Spring 2019) are all designed with grip-track banding to stay in place, moisture-wicking fabric to enhance comfort, advanced support kinesiology taping patterns and high performance compression. With Spark Sleeves, you can turn your focus away from pain and discomfort caused by chronic inflammation or sports-related injuries. Instead, add some Spark to your next activity and focus on continuing to make moves toward improved health and wellness. Learn more about Spark Kinetic Sleeves and browse other Brownmed compression products available today.